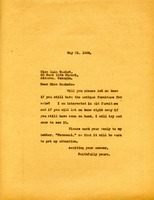 Letter to Mr. Saxon asking about antiques for sale and what the prices are. Receipt for one sofa and 2 chairs. 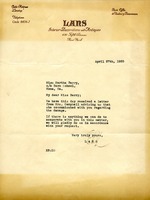 Miss Berry asks for a catalog of antiques Mr. Firman has for sale. 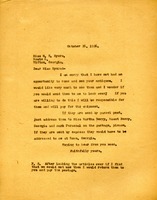 Martha Berry asks for Miss Meyers to send the antiques directly to her, and she will personally cover the costs of shipping and postage. 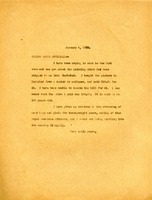 In this letter Martha Berry asks Miss Gachet if she still has some antique furniture for sale.